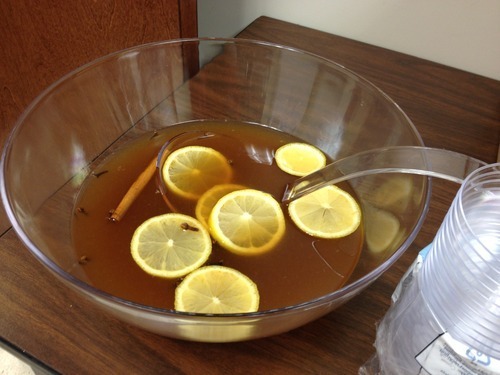 For a potluck yesterday, I decided to make the wonderful punch that was served at the Bourbon Women Association’s recent shopping event at the Liquor Barn at Springhurst. It involves a little advance preparation – you have to allow an hour for the lemon peels to mingle with the sugar – but it tastes amazing, and it will also make your house smell like the holidays. The Chai tea adds wonderful spice to the smoothness of the Four Roses bourbon, and the lemons keep it zesty. Try it at your next party. Cheers! 1. Peel 6 lemons with potato peeler. Set naked lemons aside. Put lemon peels and sugar in a bowl. Crush peels into sugar. Allow to sit for one hour. 2. Juice the naked lemons. Strain juice to remove pulp. 3. Brew the 8 Chai tea bags in the 4 cups of water. Discard bags after use. 4. Dissolve sugar and lemon peel mixture in Chai tea while warm. Remove peels and discard. 5. Add 1 cup bourbon and juice from lemons. 6. Chill in refrigerator. Before serving, add 1 can or bottle ginger beer. 7. Garnish with lemon wheels and assorted spices floating in punch. Enjoy! Even more bourbon-related gift ideas!